Girls Tennis vs. Visitation scheduled for today has been rescheduled to TOMORROW, 9/5. Girls Soccer vs. St. Paul Academy scheduled for today has been rescheduled for TOMORROW, 9/5. JV will play at 5:30pm and Varsity at 7pm. Boys Soccer vs. Hiawatha Collegiate has been postponed. Makeup date is TBD. Sports pictures: Lifetouch will be here on Wednesday, September 5th after school to take Cross Country, Boys & Girls Soccer, Girls Tennis and Volleyball pictures. Pictures may be pre-ordered at https://order.lifetouchsports.com/index.cfm?event=OrderHome&contractID=154481 or pictures order forms are available in the activities office. Simley Co-Ed High School Bowling Club: Do you have a son or daughter in 7th through 12th grade that is interested in bowling for the Simley Co-Ed High School Bowling Club? Any level of bowler is welcome. If interested, please contact Gary Salzman (coach) at ssalzman1@comcast.net for more information. Show your Spartan spirit by heading to Chipotle to support Simley Soccer on Monday, September 10 from 4 pm to 8 pm. 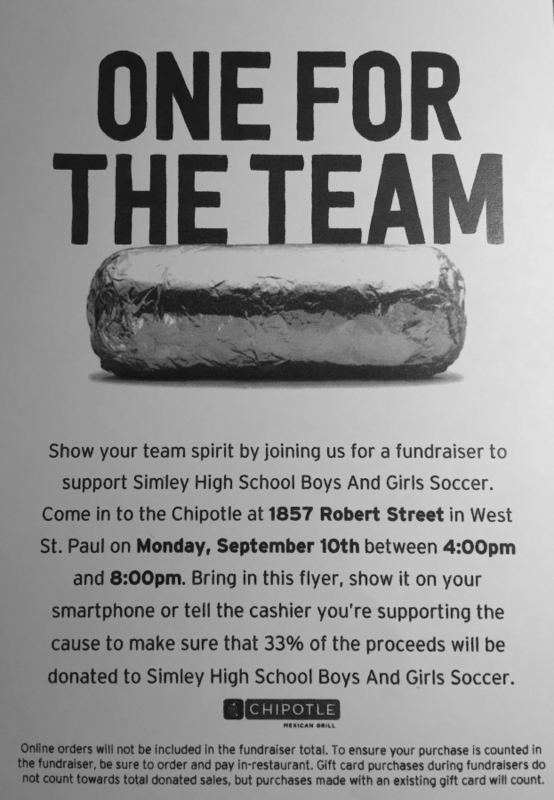 Come in to the Chipotle at 1857 Robert Street in West Saint Paul and bring the flyer, show it on your phone, or tell the cashier you are supporting SIMLEY SOCCER – 33% of the proceeds will then be donated to Simley Soccer. Calling all actors! Auditions for the Fall Play, The Government Inspector, begin tomorrow, Wednesday, September 5th! When the locals in a small town in Russia learn that an undercover government inspector is coming for a surprise visit, an unfortunate case of mistaken identity sends the village spiraling into a world of panic and greed. Rehearsals begin Sept. 10th after school. The district has changed the lunch payment program to Infinite Campus. Feepay will not be used to pay for lunches. The Infinite Campus Parent Portal allows parents to pay for student lunches, set low balance alerts and check lunch account balances. Log in to the Infinite Campus Parent Portal and select Payments to put money in the account or select Food Service to manage other settings for the account.